The ancients had a few tricks up their sleeves we are still discovering and learning from. "How did they think up something so elaborate and yet so simple in its basic philosophy?" How did buildings keep cool before the invention of air conditioning? past for simple, low-tech solutions. At the height of summer, in the sweltering industrial suburbs of Jaipur, Rajasthan in north-west India, the Pearl Academy of Fashion remains 20 degrees cooler inside than out -- by drawing on Rajasthan's ancient architecture. to provide refuge from the desert heat. Hindi word for stepwell -- are bodies of water encased by a descending set of steps. "When water evaporates in heat, it immediately brings down the temperature of the space around it," he says. academy enjoys its own microclimate. Read more from Road to Rio: The slums of Mumbai: A model of urban sustainability? Rastogi wonders: "How did they think up something so elaborate and yet so simple in its basic philosophy? takes a lot of technology for us to think up something that simple now." But it's not just the stepwells that are involved in this process of "passive cooling" -- the general term applied to technologies or design features that cool buildings without power consumption. How did they think up something so elaborate and yet so simple in its basic philosophy? The whole building is raised above the ground on pillars, creating an airy and shaded pavilion that is used as a recreation and exhibition space. Here, according to Rastogi, the walls are made from a heat-absorbing material that creates a "thermal bank" -- so the warmth is slowly released at night when the temperature drops. Centuries ago, latticed screens or "jaali" filtered direct sunlight into the palaces. The effect was decorative and helped reduce the heat. 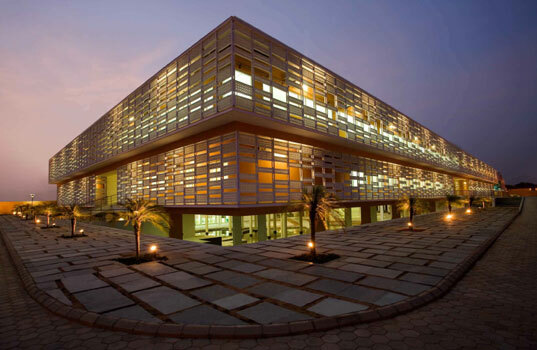 Likewise at The Pearl Academy, a latticed concrete screen runs the length of the building and provides a cooling outer skin. "We've been able to demonstrate that good green building is not only cheaper to run; it's not only more comfortable to live in -- it's also cheaper to build," says Rastogi. The success of the academy's eco-design has had an impact. Regulations -- based on these passive cooling techniques -- were introduced last year for all new Indian government buildings. Barb, so interesting how they use rice in China. I had also seen something on TV recently about the structures in Japan that are built with the shock obsorbers. That was truly amazing!.